So the first round went quite well for me. 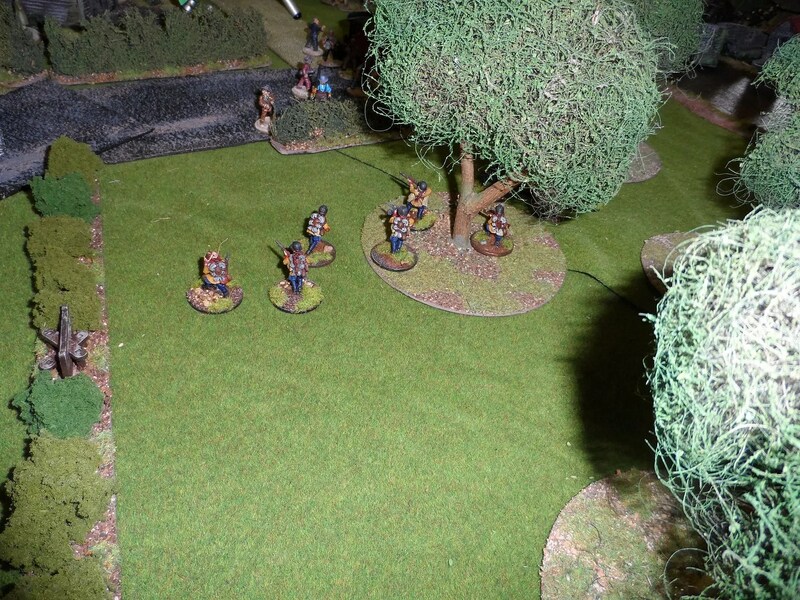 Jim’s turn ended in not much happening with his untis failing charges left right and centre. 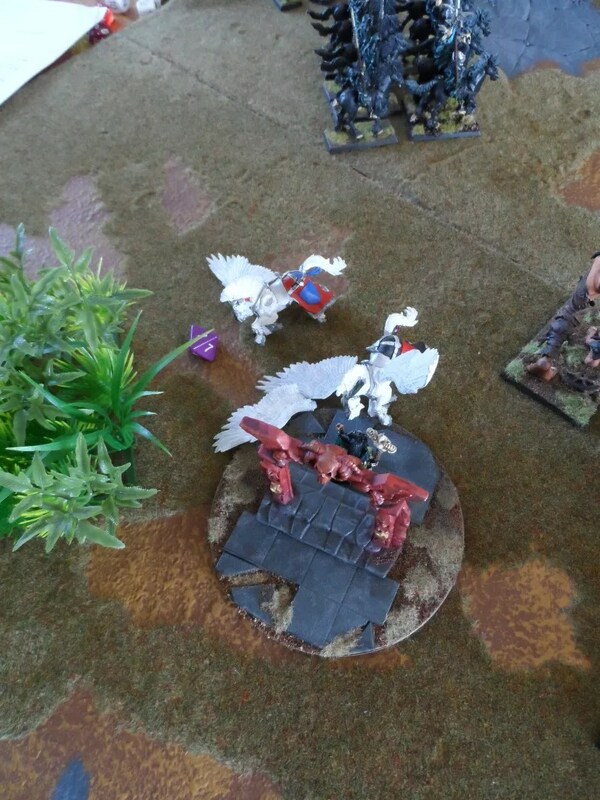 Turns out this Pegasus had a breath weapon attack, and crisped two Dark Riders ! Meanwhile two Pegasus charged in against my Sorceress on the Arcane Fulcrum – at which point we found only one model can fight against a wizard on a fulcrum…which against the odds and thanks to the Ward Save (3+) meant my Sorceress held the combat. My plans for Dark Riders toppling Ogre Butchers off of fulcrums was quietly shelved. 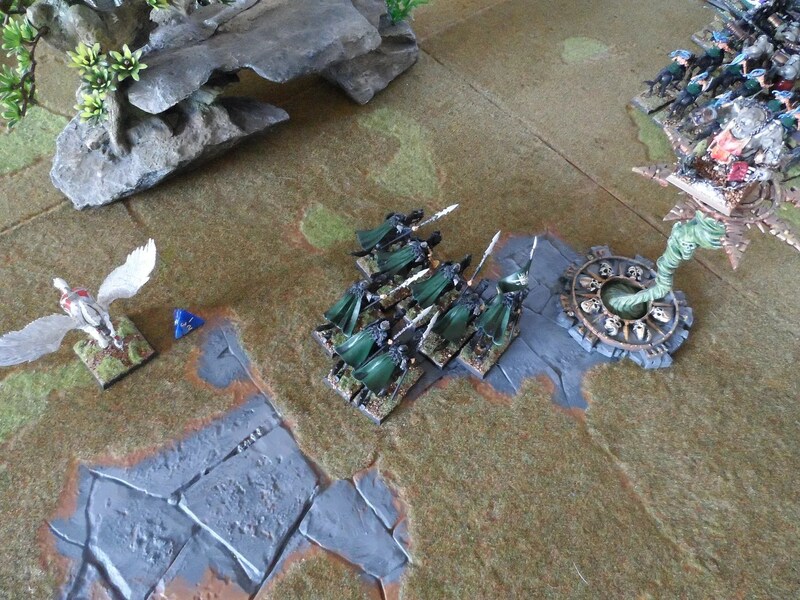 Instead, I charged the CoK, the Dark Riders and the Wa`rlocks into the Ogre Leadbelcher unit. 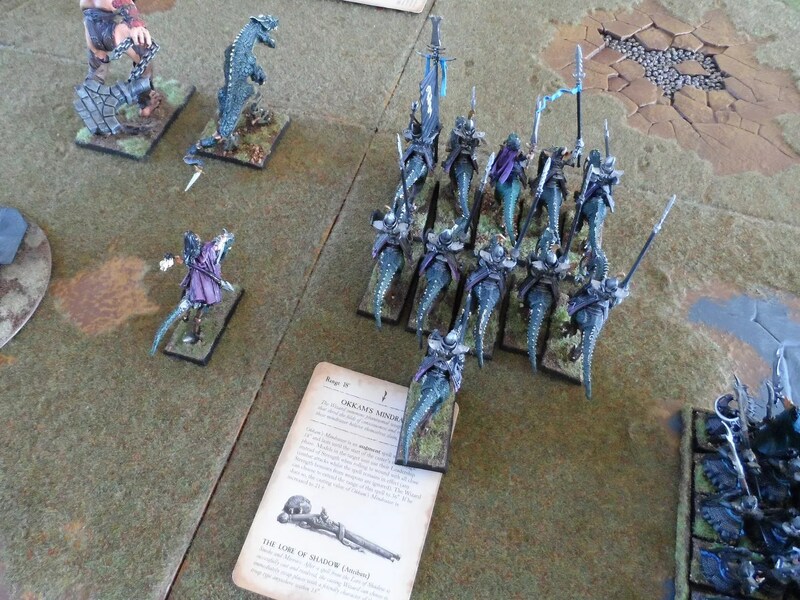 The Dark Riders failed their charge but at least were out of the pesgasus’ charge arc. 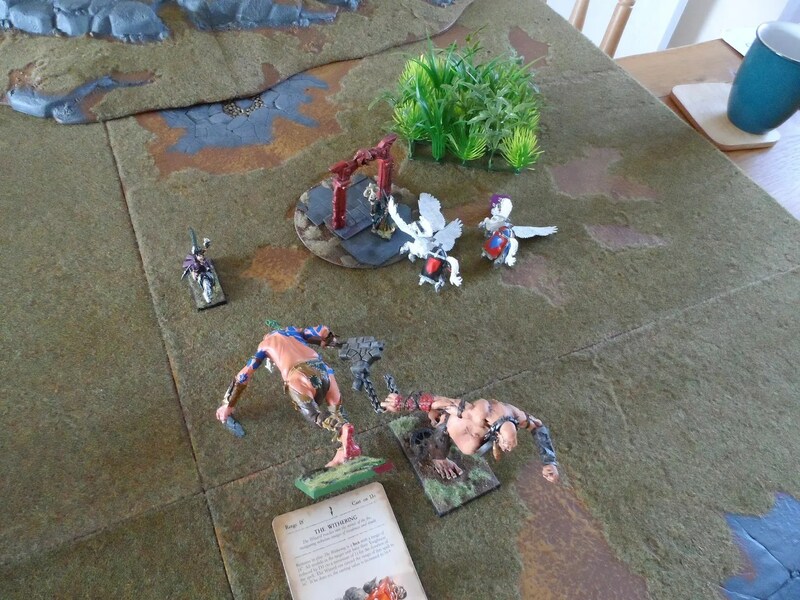 I lost three CoK on the charge and another when in combat, but managed to knock off 4 Ogres in the process of combat despite Jim managing to cast some regeneration on them. 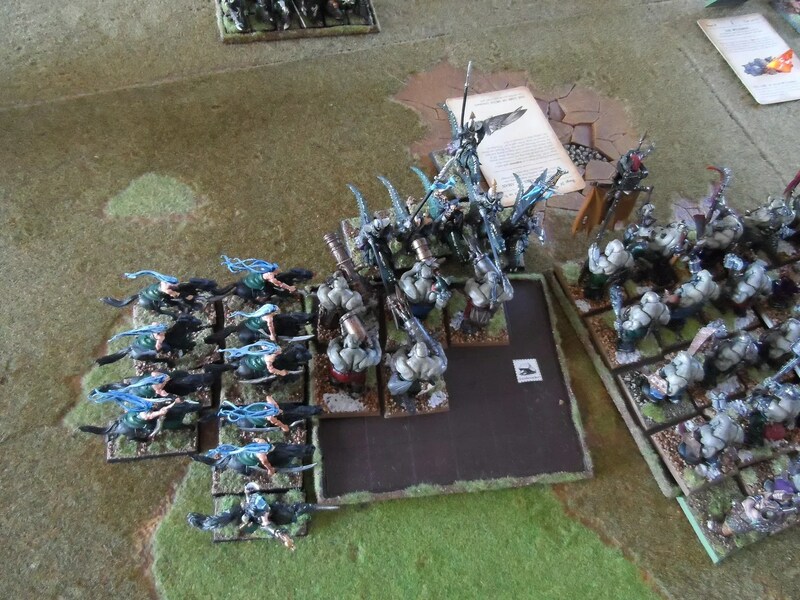 I lined up flank and rear charges for the Dark Riders and Harpies on the Ogre bulls, but at this point it all went a bit wrong. 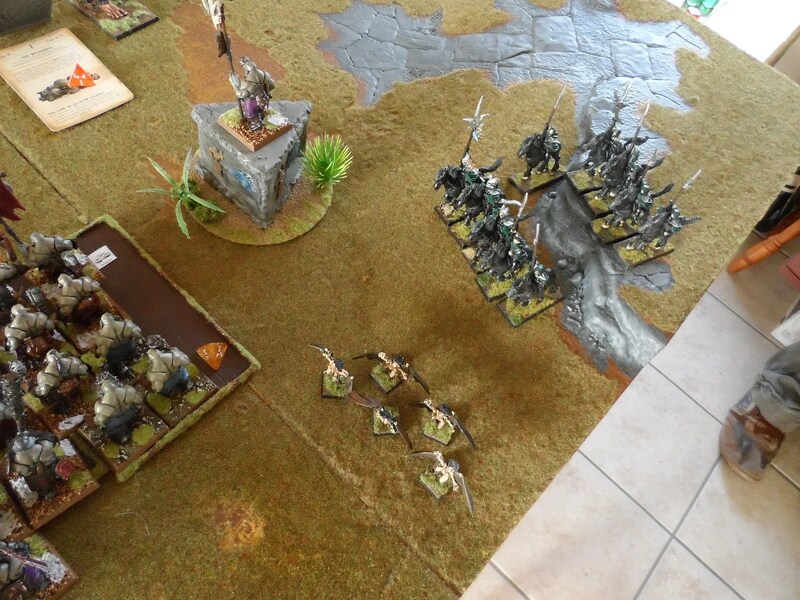 …The Ogre Bulls unit, with 5 characters in it flank charged the CoK who were still locked in combat with the Leadbelchers. 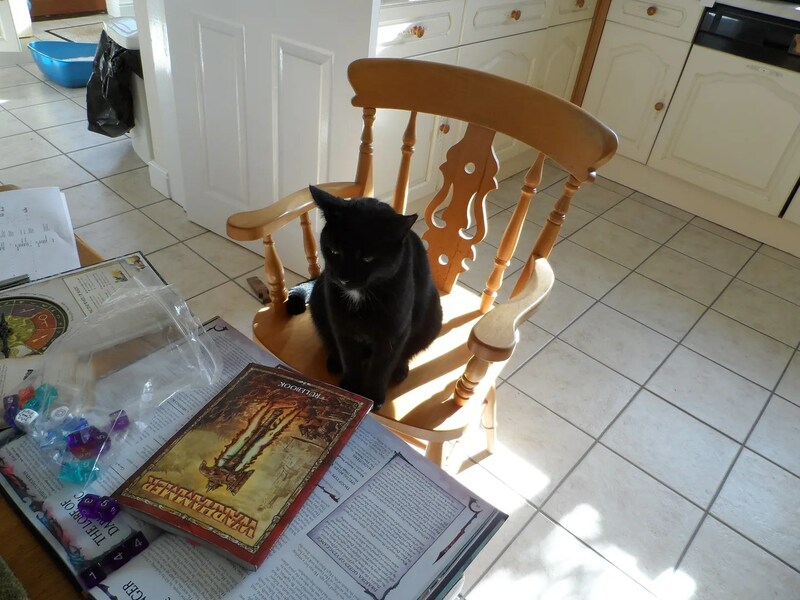 My Silver Talons were nowhere to be seen, other than ambling round the centre of the board. The CoK were destroyed and the Warlocks survived if somewhat damaged. 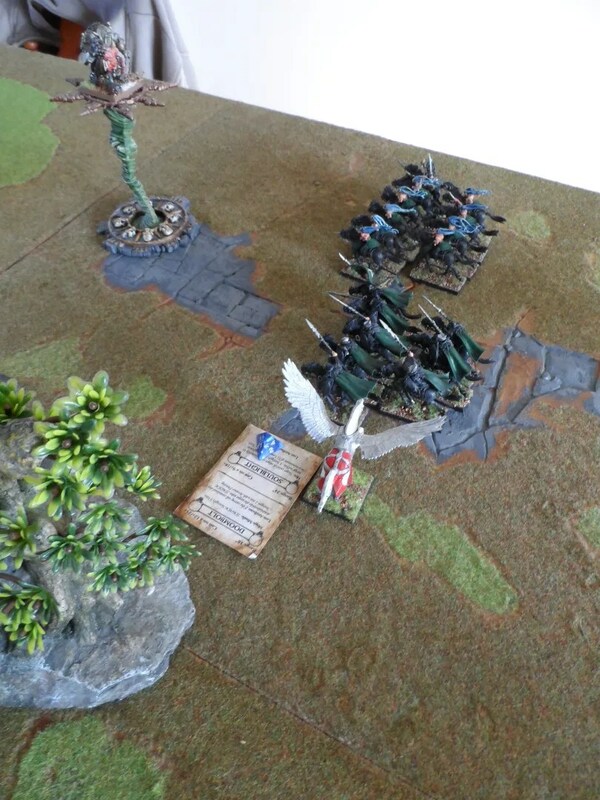 At this pointI called it a day, as I had no heavy units to take on the Bull Ogre unit. A withering glare from BlackJack. 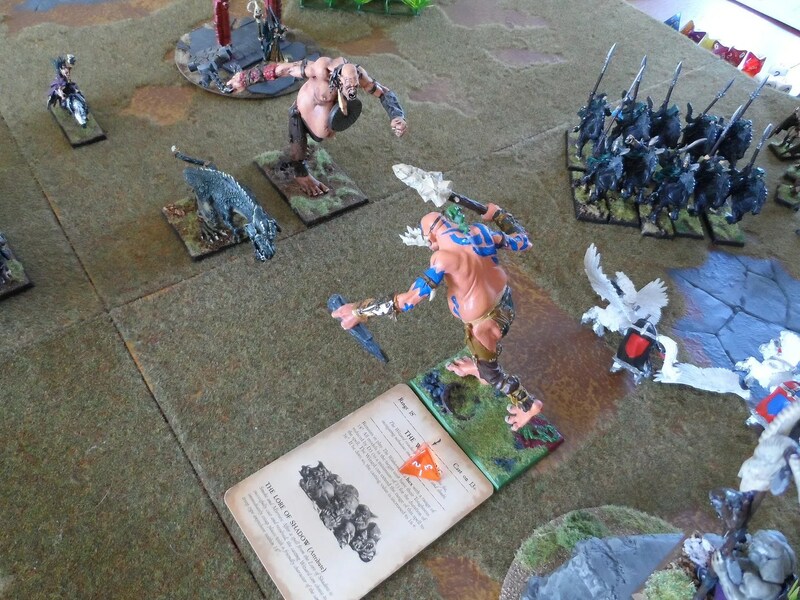 I had the wrong army to fight Ogres ! I’ll revisit the Executioers and Black Guard when facing Ogres or similar beasties in a Beastman army. Byakhee Jim & I held a short notice WHFB game using the Storm of Magic rules. because he was short on time it was a base of 2.5k PV plus the extra 25%Short on prep time I mangled my previous list as he had suggested he would be bringing an alliance of Bretonnians and Undead. 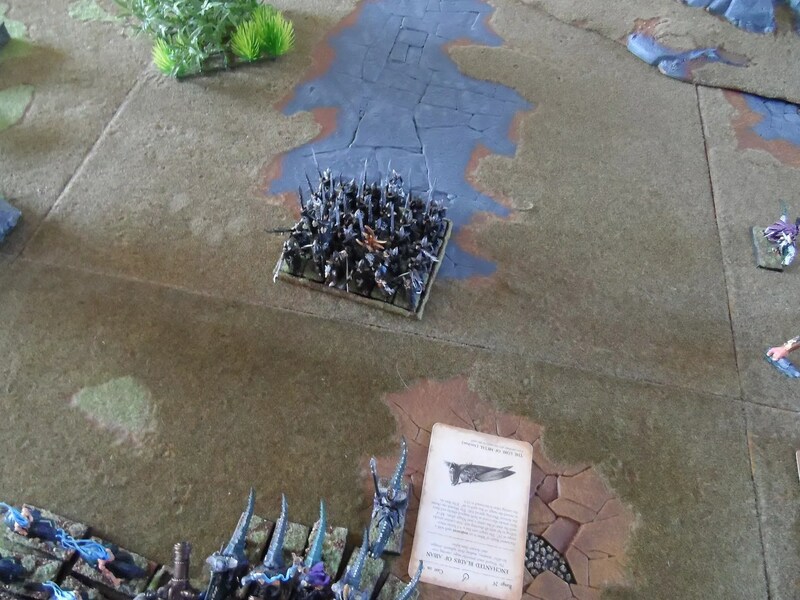 I was determined to field the Carnosaur this time ! 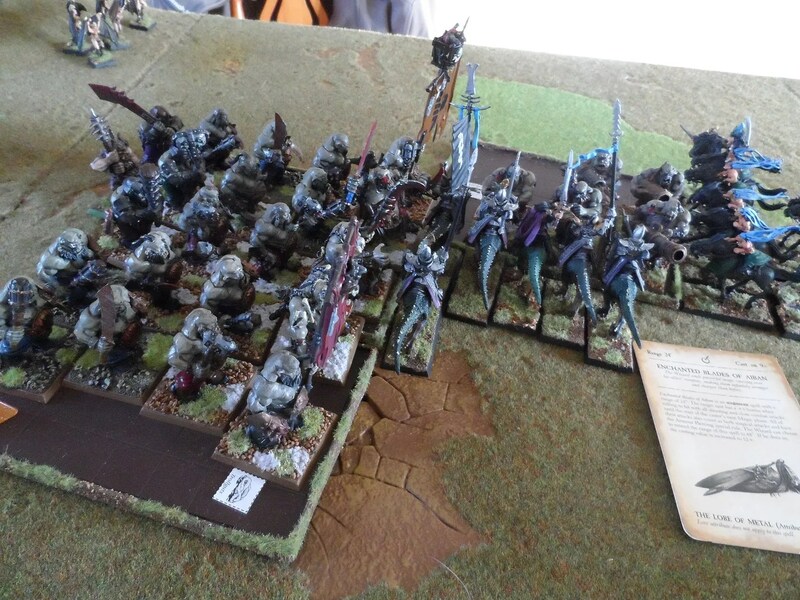 What I got opposing me was an Ogre Kingdoms army – a somewhat different prospect ! 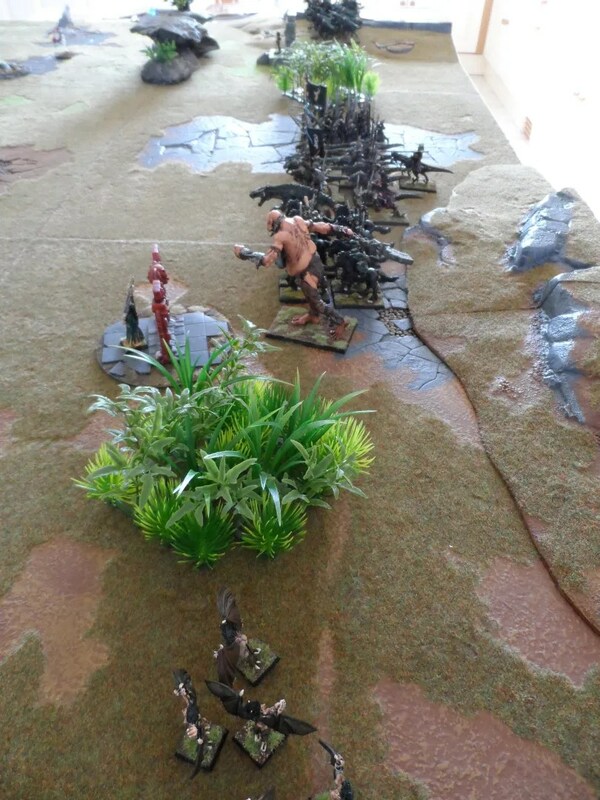 Hmm, lots of Fast Cavalry against two massive blocks of Ogres. 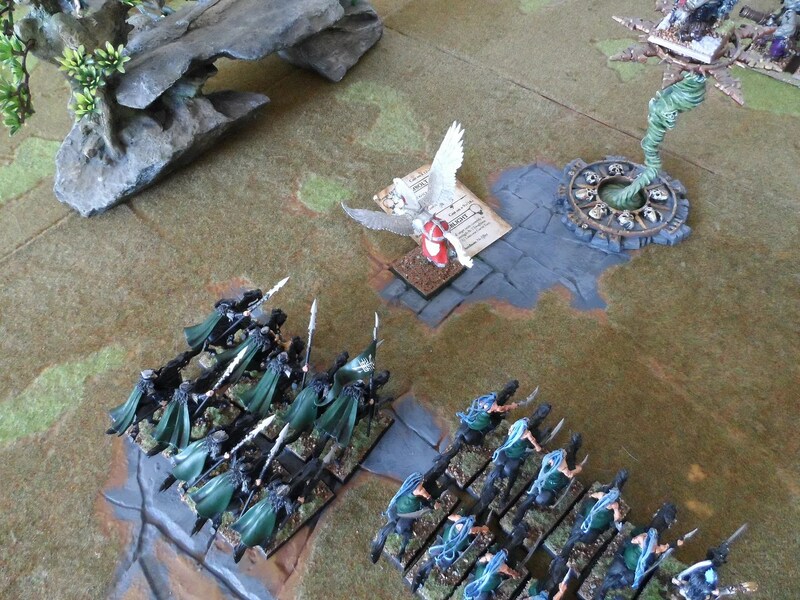 And some Harpies, the bane opf any Ogre army…at least I did have a Giaat and a unit of CoK. 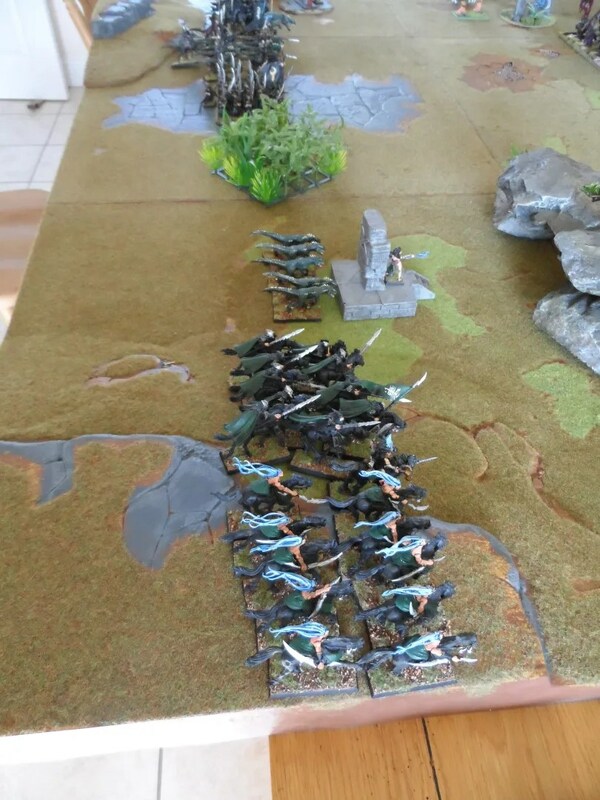 Witht he wonders of Vanguard move, and then winning the toss, my Fast Cavalry got round the side of the Ogre flank quickly. I also had a very good magic phase. Getting off some spells to reduce the effectiveness of the Pegasus, and the Giant (which turned out to be a Bone grinder giant, so better than my ordinary giant). 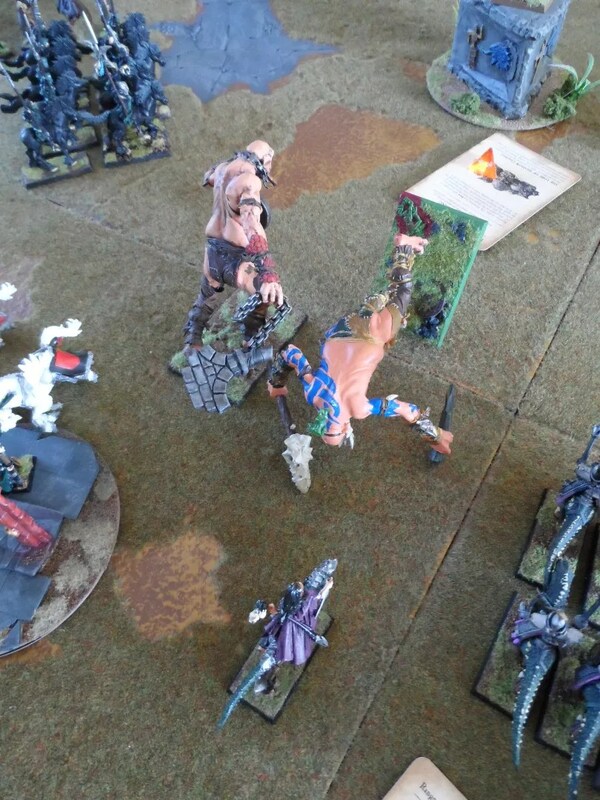 Whilst pumping up the CoK, in case Jim decided to charge his Giant in against them. 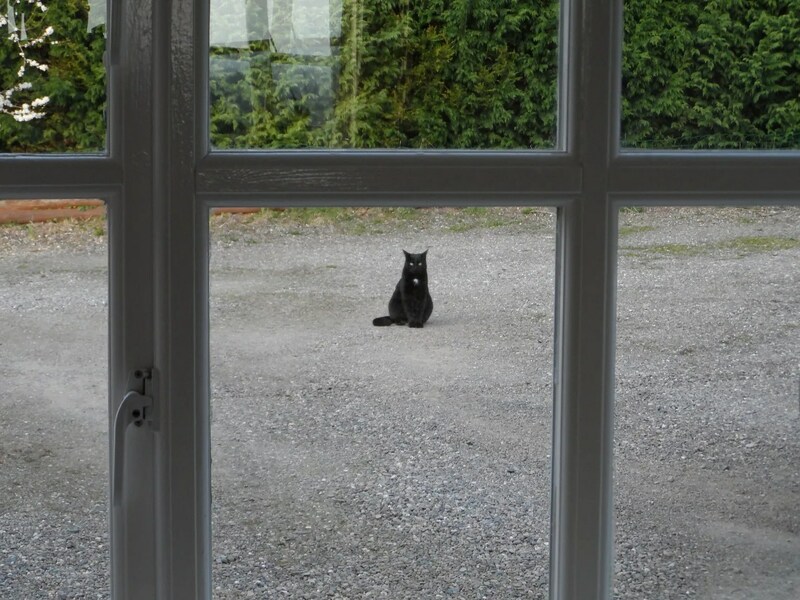 BlackJack, looked on with approval. 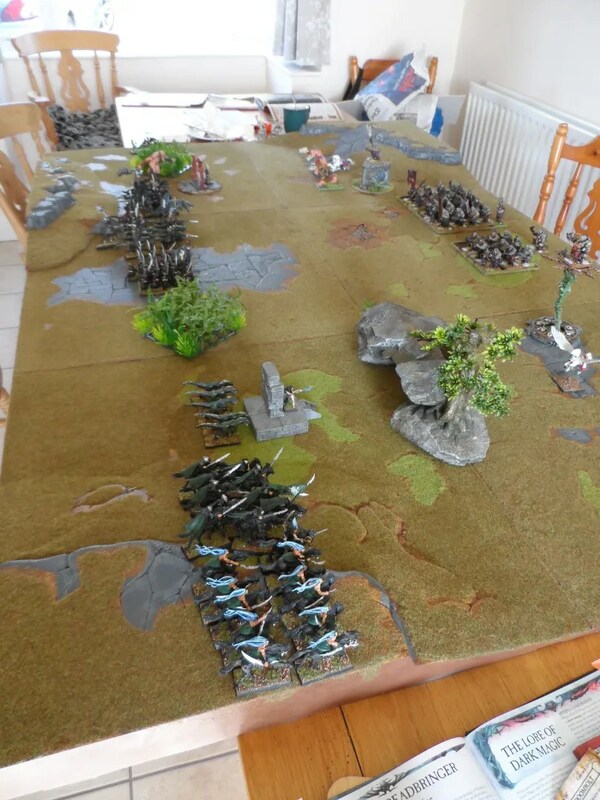 Here’s some shots of the otehr table at the Big Game. 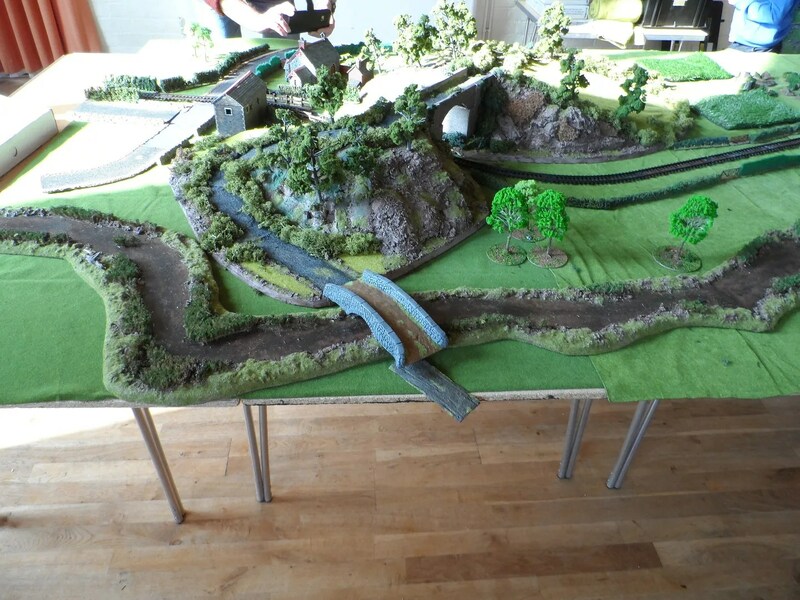 Following on from last year’s game, the bridge at Titley Junction had been seized by a bunch of ne’er do wells, and the Royalists decided to dislodge them in a return attack ! 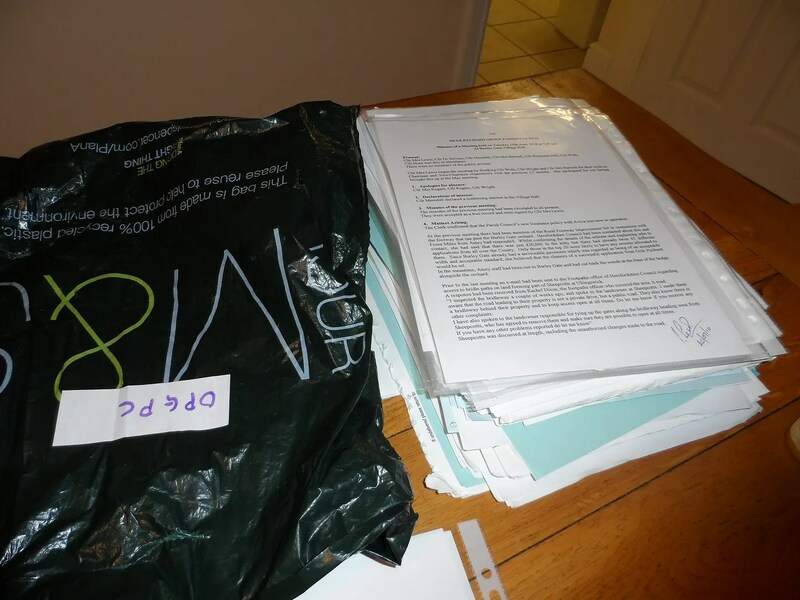 Below this write up is a couple of links to other people’s blogs/propogande mouthpieces. Roo’s Big Beast of a hill and bridge were back in action. As were his colonial troops lead by his South Africans. 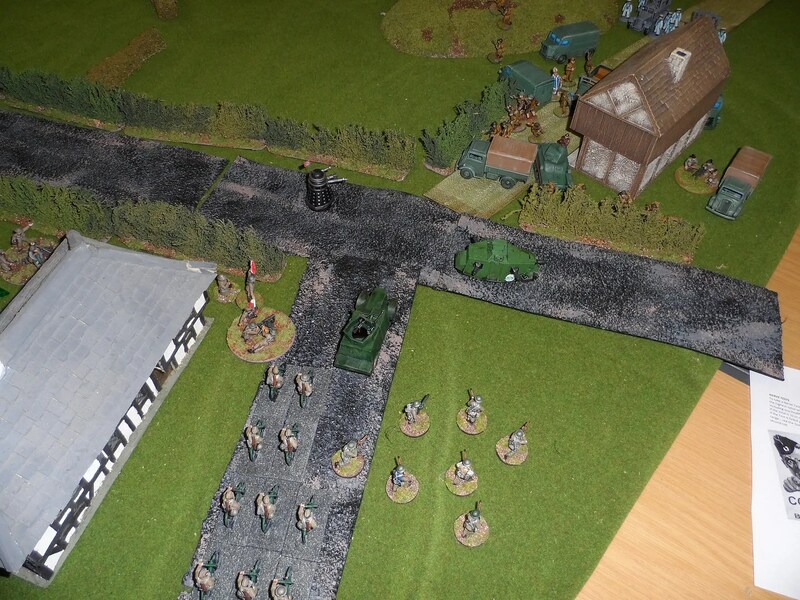 Including a cunniongly disguised vehicle. 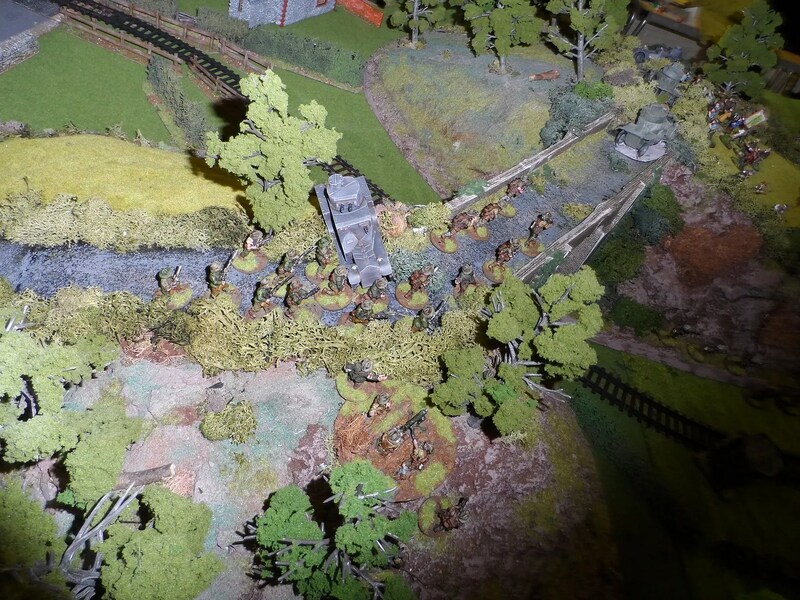 A/C’s climb up the embankment. To fight the waiting Welsh and their AL allies. 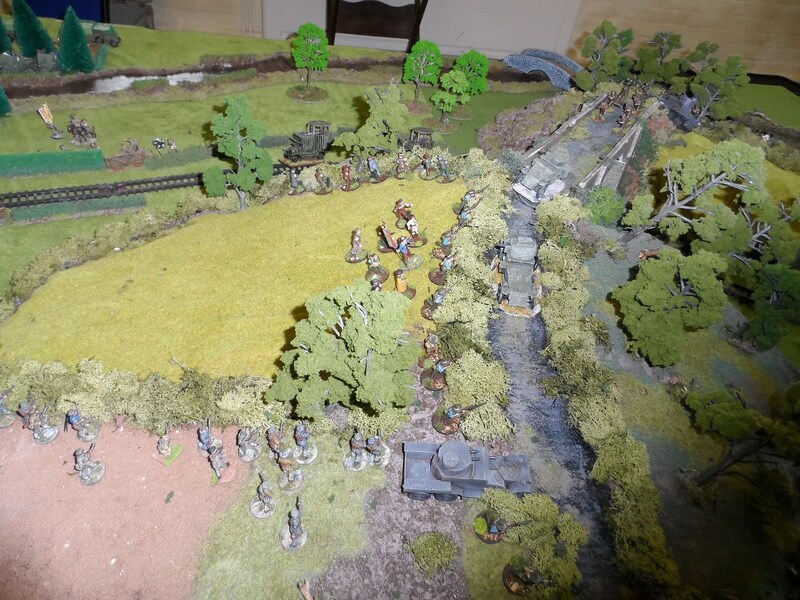 Fighting on the ridge again. 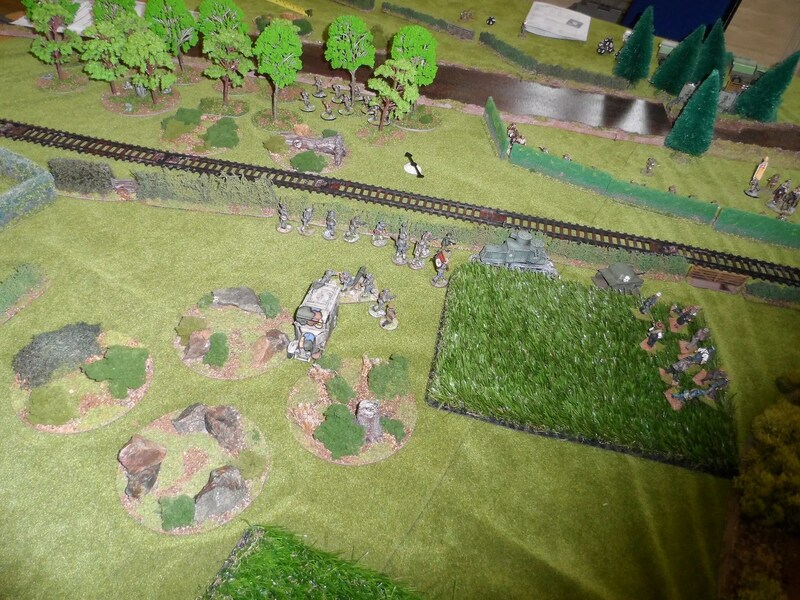 Steve’s forces fight over the railway line. The Royalists (JP, Roo & Steve) were triumphant, with the Welsh (Tom & J) conceeding defeat and withdrawing in good order. 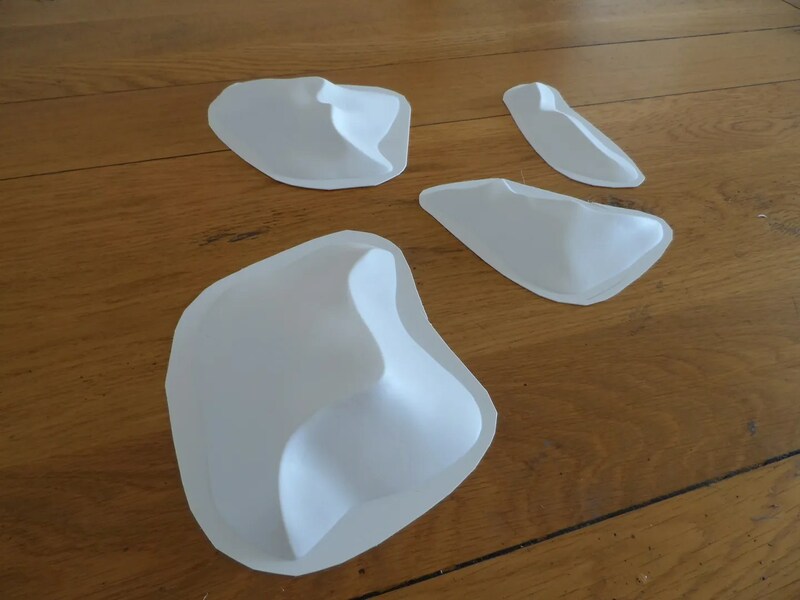 Some other blogs – beware of the propoganda ! 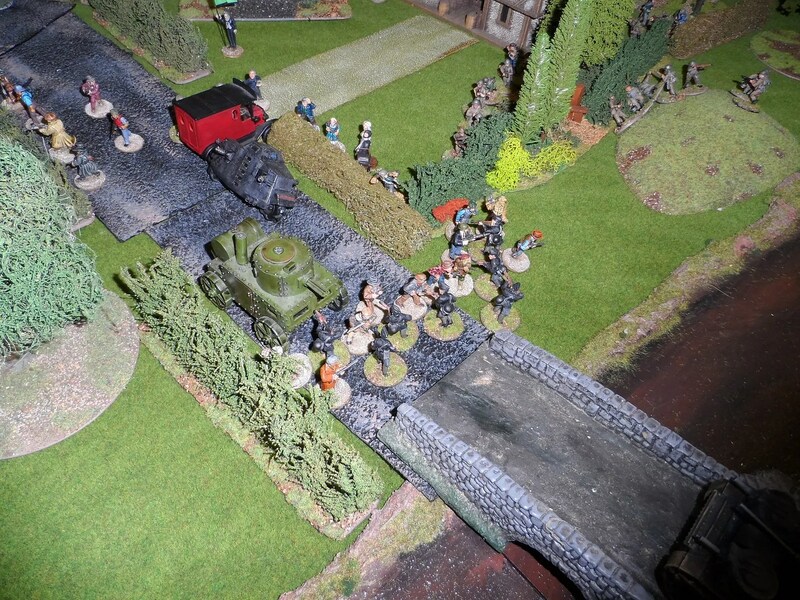 Sir Gilbert’s View – from Doug of EM-4 miniatures. 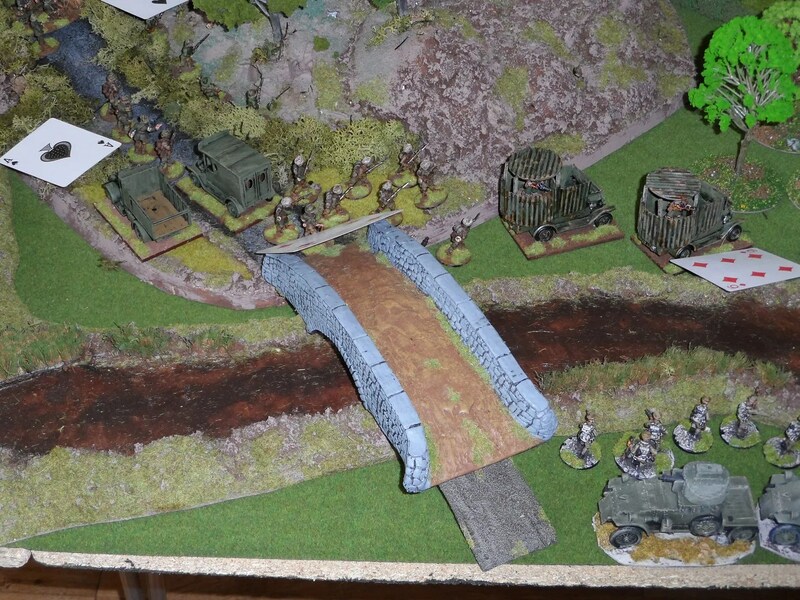 By now the BUF had secured the bridge and were racing to reinforce it, leaving my forces (the MHC) facing the Bishop of Ludlow’s forces, complete with their rocket launchers. 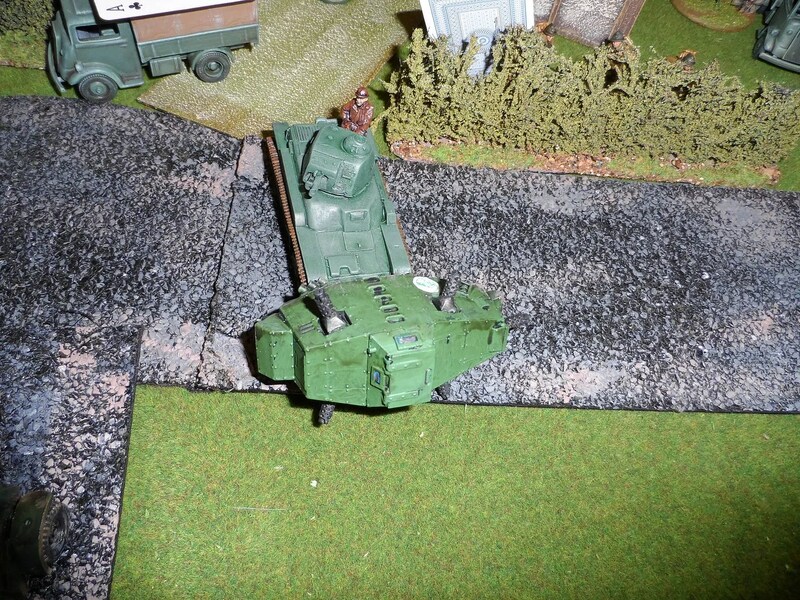 The Bishop’s French tank after paasing a nerve test, ramed the QoD in the side knocking it over, and causing it to explode ! 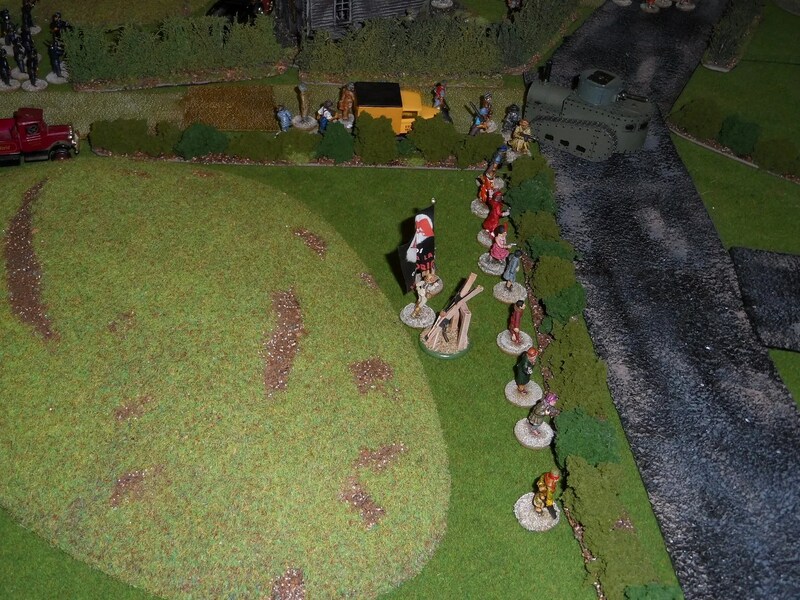 Whilst the pepperpot hastily reversed up the road to provide cover for its BUF comrades on the bridge, the BUF charged eastwards over the bridge and into Sir Gilbert’s rabble. 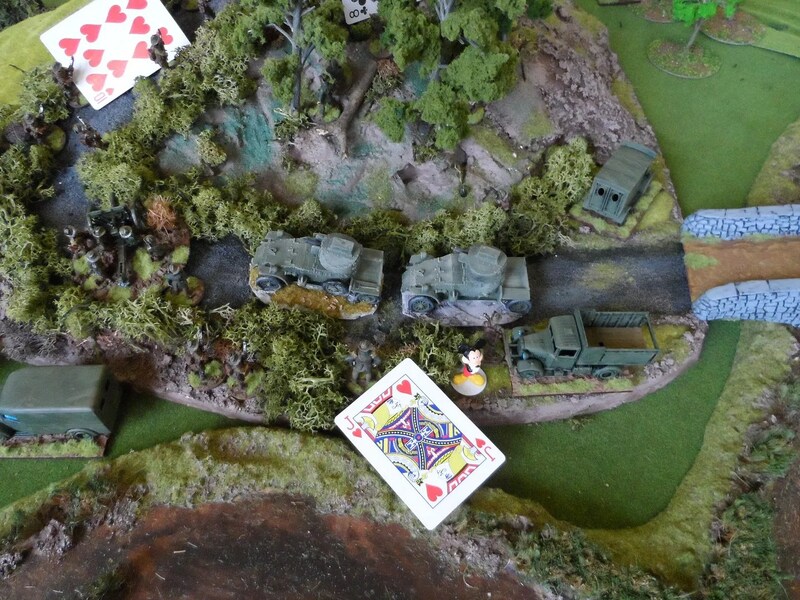 The BUF’s QoD rode through this mess and injured precisely no-one based on my hastily made up rules for tank shock ! 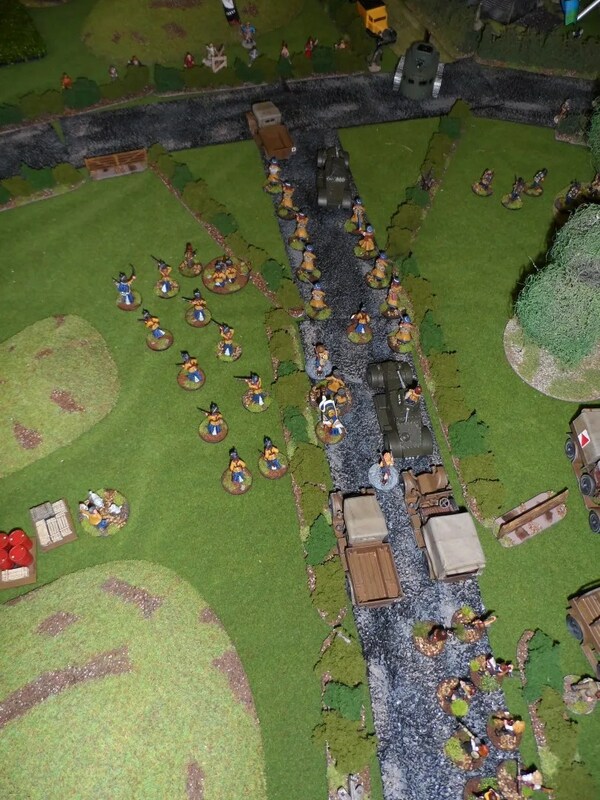 Lady Maud’s column advanced and engaged Sir Gilbert’s troops, distracting him sufficiently to prevent proper support in attacking the bridge. 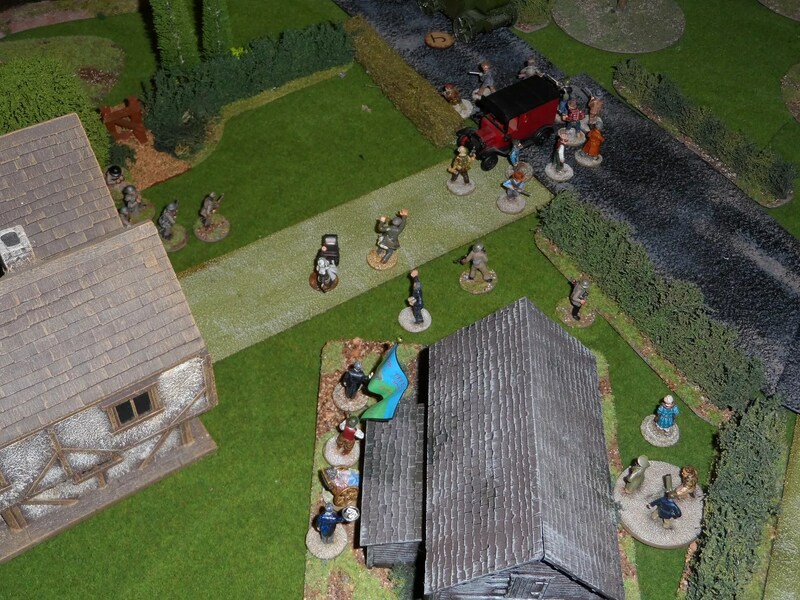 Rev Verity’s bombers failed their nerve test and refused to attack the QoD which was immobilised but spitting HMG fire left right and centre at Verity’s other troop’s and Sir GHilbert’s that were facing off against Lady Maud’s troops as they moved through the open woodland. 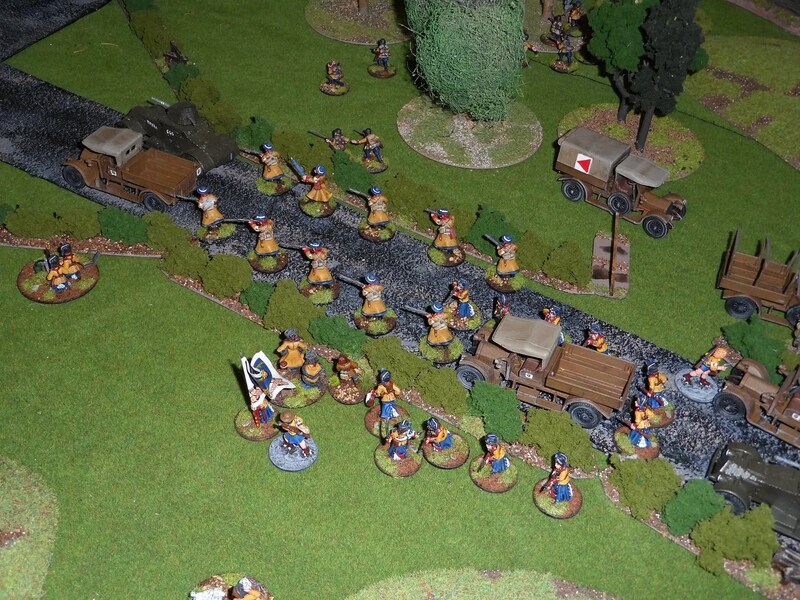 The Bishop’s seamen had fired off their rockets, and armed with pistols lined up for a rendtion of YMCA before heading off for a cross country march. The rockets had rpoved not very effective (as all AVBCW contraptions should be), but had shelled the farmhosue taking out 3 brave MHC troops. 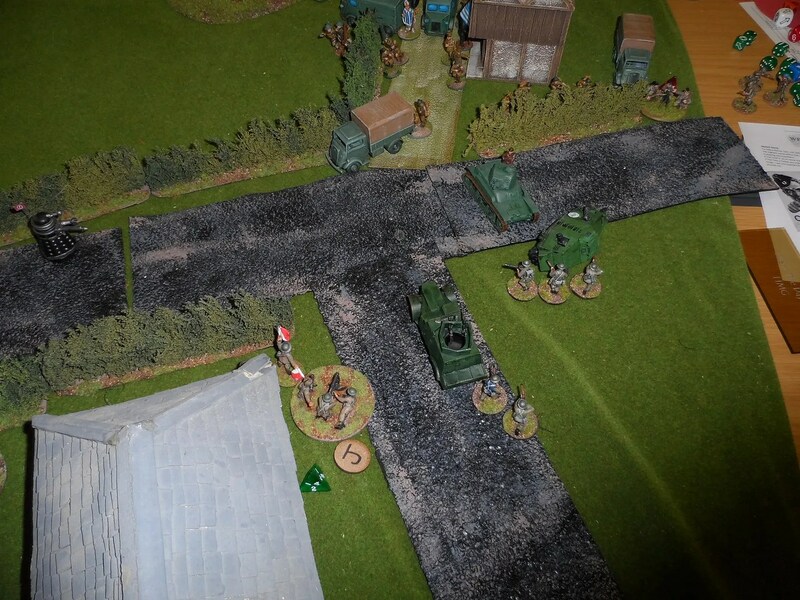 By now the Bish’s tank had roared off down the road after the pepperpot, but it was the closing stages of the game as dusk fell. 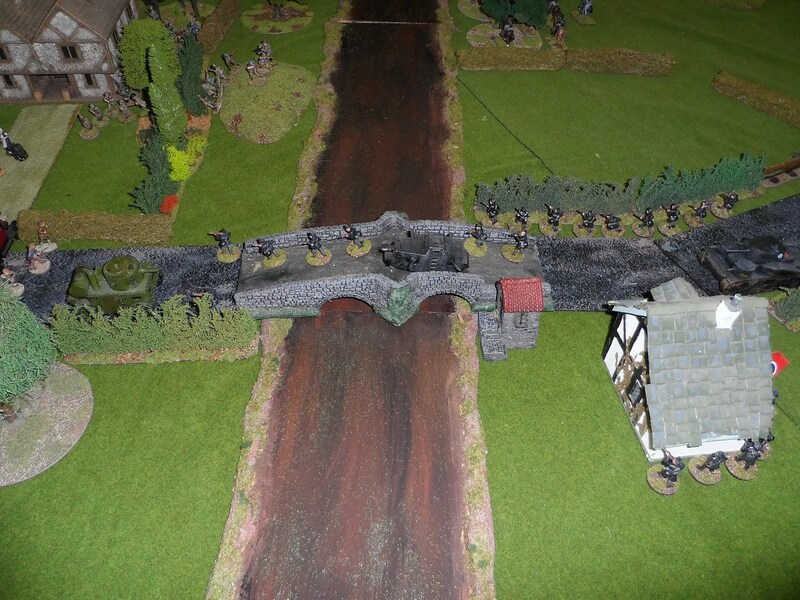 The BUF section was eventually repulsed by Sir Gilbert’s lackeys, and regropuped on the bridge. 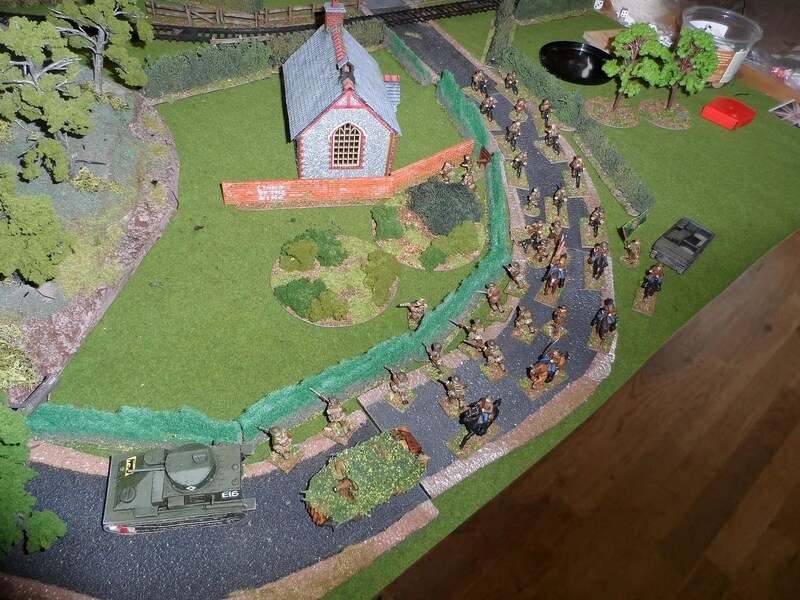 the MHC had the equivalent of two sections holed up in the farmhouse a semi functioning mortar and HMG with which to fend off the sailor boys and the remaining section of Anglicans. 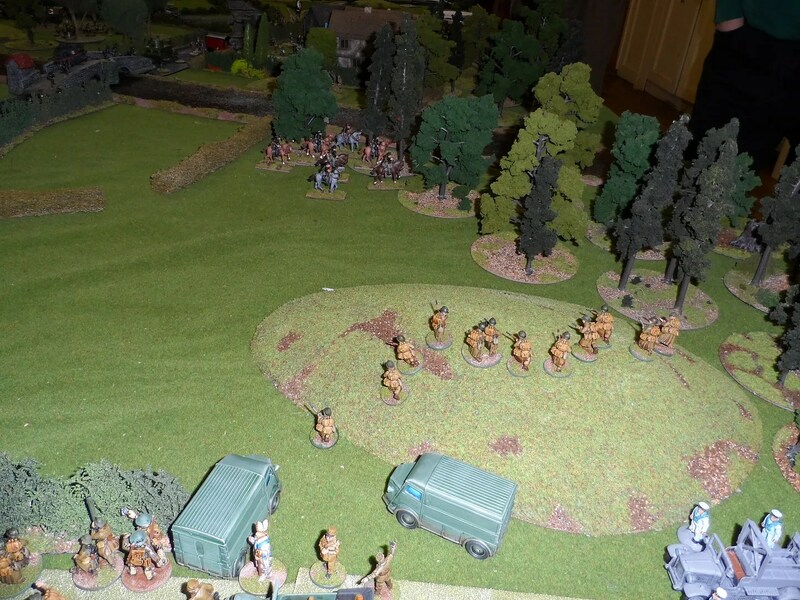 Lady Maud’s troops were barely scratched, and the BUF still ahd a cavalry squad menacing the flank of the Bishop. The jury is still out on who actually won the battle. Best of all a good time was had by all. To follow: propoganda broadcasts by less worthy news-sources. 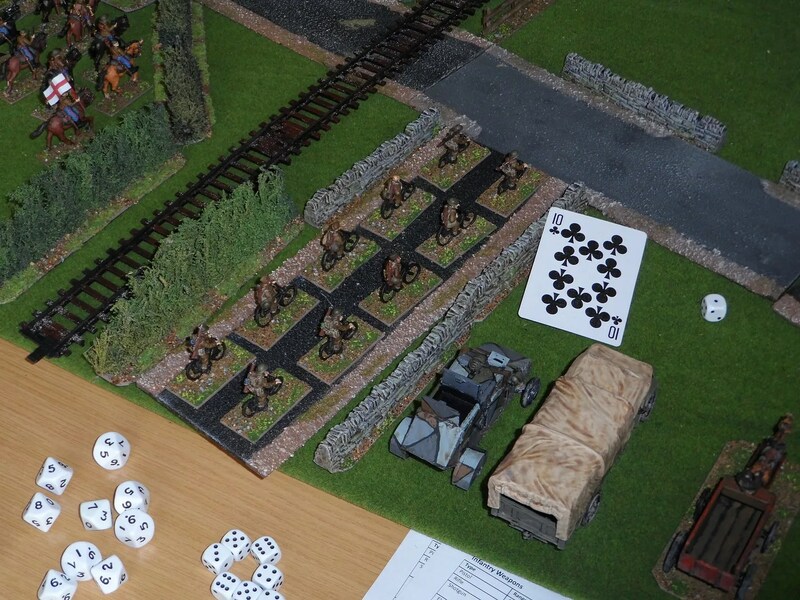 AVBCW dice by EM-4. Doug, one of my adversaries is the proprietor of Em-4 but kindly sold us these dice at a discount price on Saturday – thanks Doug ! Normal d6, but with the 6 replaced with a logo by PanzerKaput for one of the AVBCW factions. 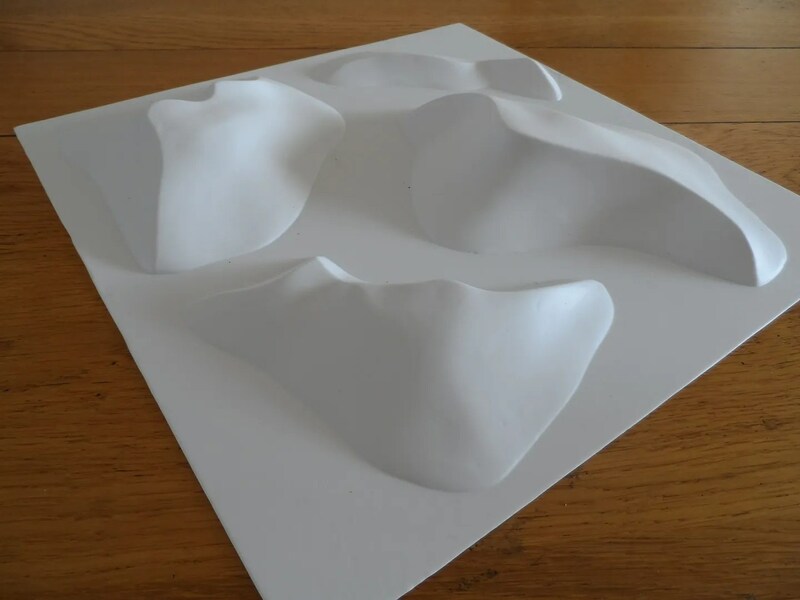 Not a transfer but actually etched into the surface so it won’t wear off. 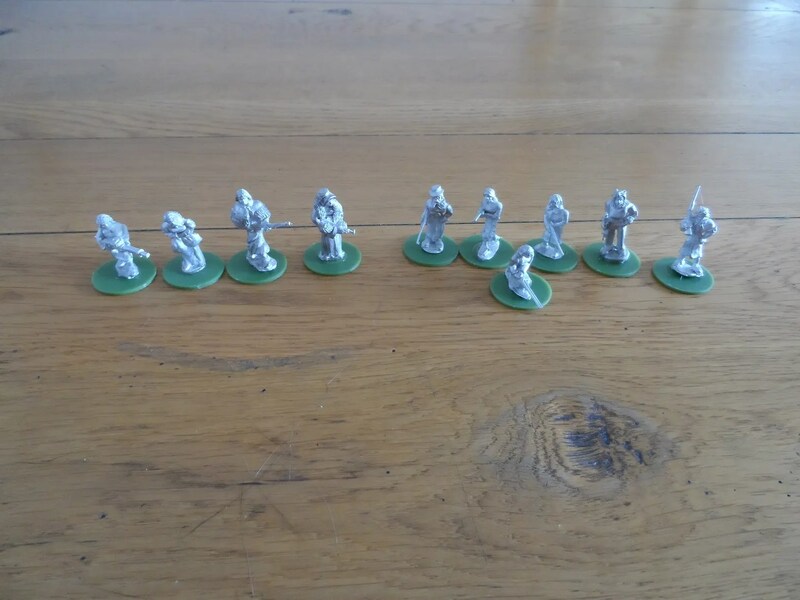 Some RCW gun crew gifted to me by Tym on Saturday to compliment my current gun crew ! One rubber glove in black and red. 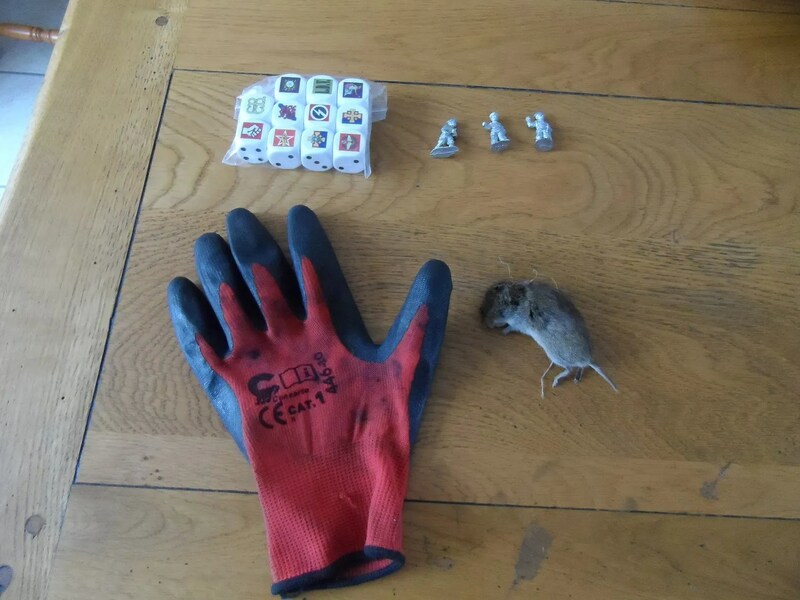 Found on the front doorstep after the event, obviously brought home by a ferocious cat that had tracked it down and captured it. A sweet slice of psychedelia. One rodent, probably a mouse, becauswe I am obviously not eating properly – too much fruit and veg. The battle now hotted up. 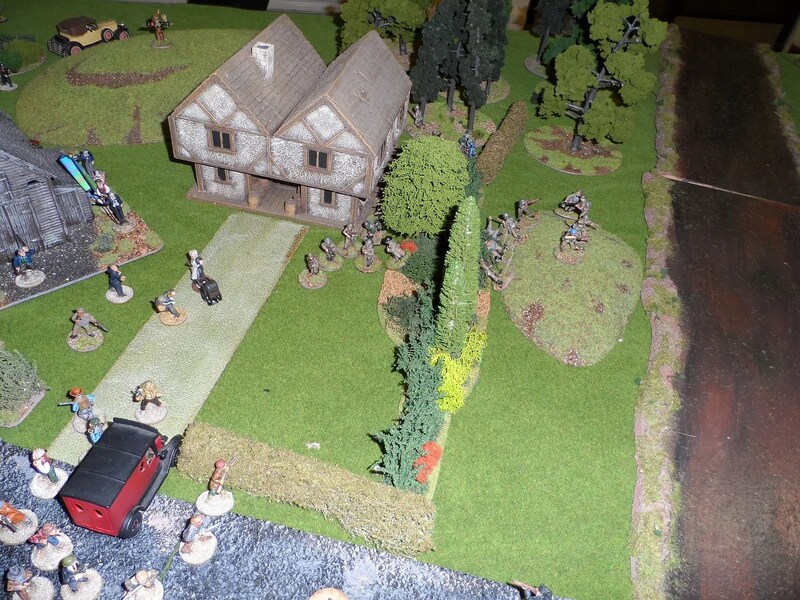 The MHC supported buy the pepperpot, seized the road junction to the west of the river/bridge just as the Anglicans under the devious Bishop of Ludlow arrived, and a shoot out started. 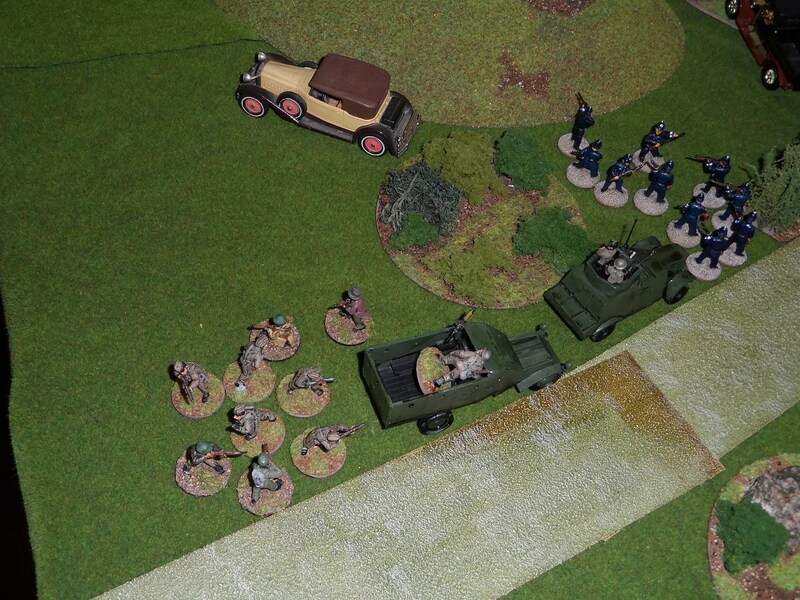 The MHC QoD roared up and gave the BIsh’s forces a broadside to much squealling. Meanwhile the BUF cavalry rode over the hedges and into the woods on the western side of ther river, to “menace” the Bishop’s forces who promptly had to turn and face this threat – Arrowmsith’s infamous cavalry charges could not be ignored ! 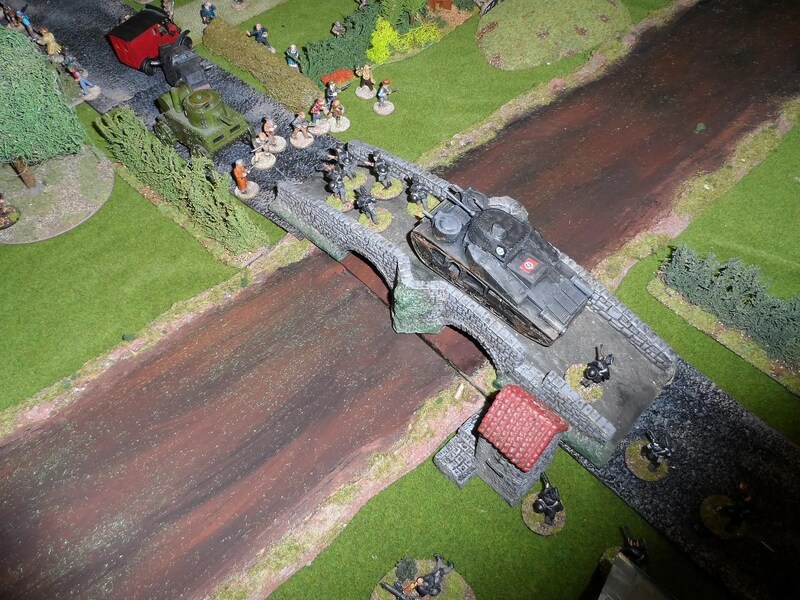 Meanwhile, as Sir Gilbert’s latest steam A/C contraption chugged forward, Arrowsmith snarled and forced his QoD forward onto the bridge in order to support his infantry. 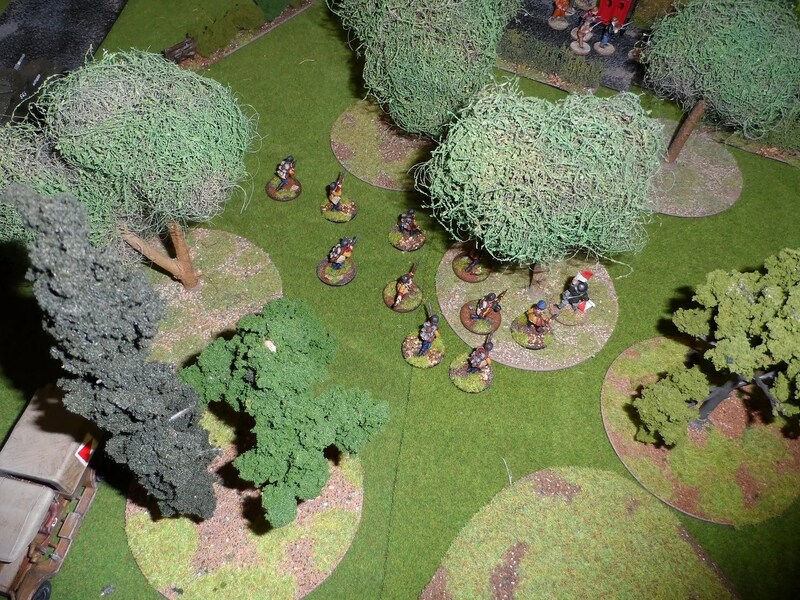 Verity’s forces burst out of the trees and started sniping at the BUF, along with Sir Giulbert’s retainers. 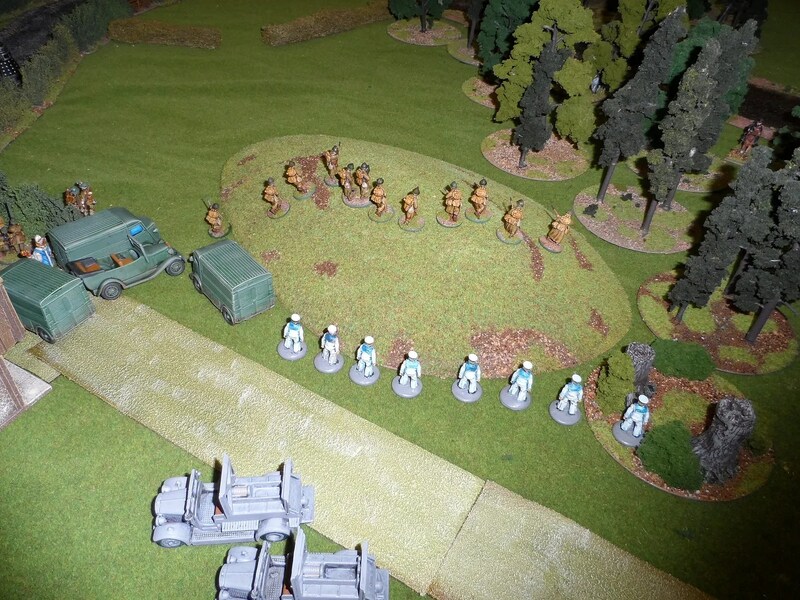 Lady Maud’s female Jaeger’s infliltrated the open woods on the east of the roiver, pasing the BUF mortar spotter team which had been firing ineffectually for several rounds. More women emerge from the trucks ! Supported as they were by the gallant menfolk of Rev Verity and the (paid for) Police of Sir Gilbert. 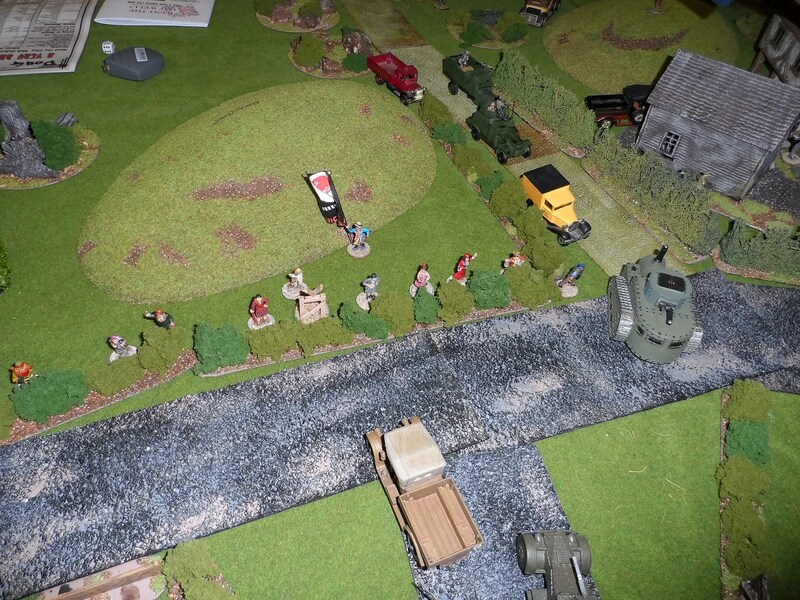 Sir Gilbert and Rev Verity’s troops converge east of the bridge before the fiunal push from both sides.